Published: Feb. 24, 2013 at 03:05 p.m. Updated: Feb. 25, 2013 at 03:30 p.m.
Oakland Raiders defensive tackle Desmond Bryant was arrested Sunday morning in Florida on a criminal mischief charge, the team confirmed to NFL.com and NFL Network. 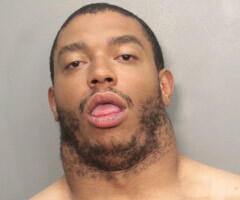 Mug shot of then-Oakland Raiders defensive tackle Desmond Bryant after his arrest on a criminal mischief charge. (Miami-Dade Police Department). Bryant was booked into a Miami-Dade County, Fla., jail at 9:24 a.m. ET and was being held on a bond between $200 and $1,000. "We're aware of the situation and are gathering more information," Raiders spokesman Zak Gilbert said in a statement. It's never a good time to get arrested, but Bryant's slip-up is especially poorly timed. The 6-foot-5 veteran is entering unrestricted free agency for the first time in a few weeks. He was seen as one of the more talented defensive linemen on the market and was in line for a solid contract. This will complicate matters. The similarity of Bryant's name to Dallas Cowboys wide receiver Dez Bryant caused some confusion Sunday morning when a Sun Sentinel reporter initially misidentified who was arrested. Dez Bryant posted on Twitter: "Ooo (expletive) false rumors about jail? Lol I was working out at 2 something in the morning in Dallas." There's even Twitter proof of said workout, not that we need it.